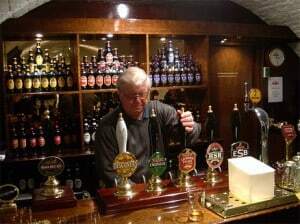 There were reports earlier this year that pub closures have slowed to 25 per week in the UK, although this figure is less than in previous years, it’s still grave news for the industry with local pubs still effectively being the hub of local social life. So, it’s nice to hear a hearty tale once in a while… Locals in Crosby near Penrith have clubbed together to save their local, The Butchers Arms. The pub, which has been closed for 6 months has now been resurrected by local shareholders, some 300 people investing in shares of £250 (minimum) and raising around £300,000. With new Landlords Kev Taylor and Bev Percy at the helm, they have been quoted as saying “We have been amazed by the dedication and efforts of the community and volunteers” (source BBC News). 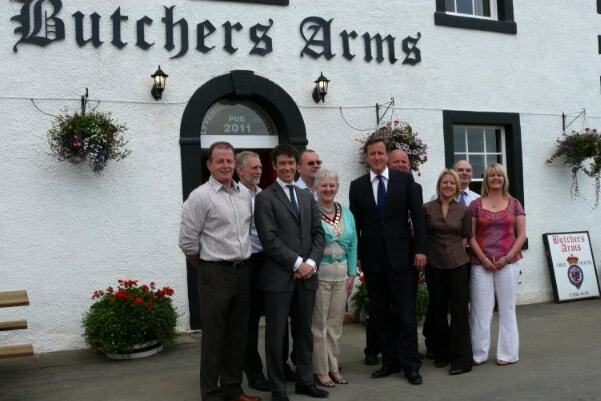 The Butchers Arms will – through the dedication of it’s local community no doubt continue to flourish. The co-operative purchase model could well be that the future of local pubs-in-need, turning to their local communities for financial support. Prime Minister David Cameron even visited The Butchers Arms keen to promote the local community spirit as part of his plans to rebuild British society in the wake of the abysmal rioting. You can read the full story on the Lyvennet Community Pub website. The Butchers Arms is the not the only co-operative owned pub in the county, The Old Crown at Hesket was purchased by more than 100 locals in a similar deal. If you’ve any comments you’d like to add about The Butchers Arms you can do so in our comments section below or join in the conversation on our Facebook page. The August Bank Holiday is upon us BITE readers, the last Bank Holiday of the year. This Bank Holiday is a small reminder that once again people will begin to ask you “what are you doing for Christmas?” It didn’t seem like that long ago we were being pestered with the same questions in 2010. Be prepared this Bank Holiday, the weather for most of the country is looking dry/ cloudy or sunny, you’ll likely be questioned about all of those D.I.Y. jobs that you put your name to at the start of the year, yes… they still need to be done. Forget the looming Autumn/ Winter, get your friends together and get the beers in – maybe fire up the BBQ one last time. Or, get down your local and raise a pint to the last drops of Summer 2011. Cheers! You might be thinking you’ve already got this one already worked out, “The Crown Inn” surely means a hat-tip in the general direction of the reigning monarch, and to some extent you’d be right in thinking that. 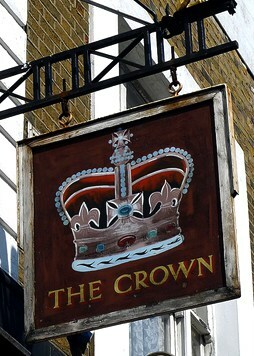 But where did the name “The Crown Inn” originate from. Well, in the 17th Century, England was in the grip of civil war (1642–1651). Royalist ‘Cavaliers’ – loyal to King Charles I are fighting against the Parliamentarians ‘Round-heads’ loyal to Oliver Cromwell. Cromwell was successful in capturing King Charles, who was then tried and executed while his son Charles II escaped to France. Cromwell disposed of the power of the monarchy over England and assumed power as Lord Protector in the first Commonwealth of England. Cromwell, a deeply religious man or ‘Puritan’ – abolished many types of recreational fun, fashion, sports, and even Christmas (Puritans found no justification for celebrating Christs birth despite being Christian). Cromwell’s glum reign however, was to be a short one, just 5 years after taking power in 1653, Cromwell died in 1658. Despite being mentally capable, Cromwell was known to be physically drained suffering from constant bouts of sickness and fever. His death plunged an already subdued and mournful England into deeper depression. Now without a leader and in political turmoil England needed to rise again. This came through ‘The Restoration’ of the monarchy in England and the return of Charles II from exile who took to the throne on 29th May 1660 – also known as Royal Oak Day, and there are the origins of “The Royal Oak“, another Great British pub name. Charles II was known affectionately by the people of the time as the Merrie Monarch because of his liveliness and hedonism, his return to the throne lifted England’s spirits and in celebration of their new king – pubs, inns and taverns used the name “The Crown Inn” as a symbol of their allegiance to the restored monarchy and with it a new sense of creative freedom was given to the country. Despite the later years of Charles II’s reign being blighted with the Black Death (plague) of 1665 and the Great Fire of London 1666 in which both Charles and his brother James joined fire-fighters and managed the fire-fighting effort, Charles II was a successful well liked king of England. ‘The Crown Inn‘ is number 9 in our ‘Top 10 Pub Names in the UK‘, and it’s a fitting name for any pub to show their support for the country’s monarch, but spare a thought for Charles II, his influence in this pub name is dutifully deserved. If you’ve any comments feel free to leave them in our comment section below, or join in the conversation on our Facebook page. Cheers! Wind the Great British history clocks back to the 16th Century and you would have noticed a fair few pubs, inns and taverns with Roman Catholic sentiment titles; “The Lamb” a representation of the innocence of Christ (the Lamb of God), “The Ark” a nod to Noah’s nautical challenge, “The Cross” a symbol of the crucifixion of Christ and a way-point sign for pilgrims and soldiers heading East to Jerusalem. These were historic references to symbols of the holy crusades (1096-1204) and an earlier religious-militarist Britain. In 1533 Henry VIII was the charismatic, educated king of the day, famous for his trail of destruction through the female population in a quest for an heir to his throne. It was due to his second marriage that the king incurred the anger of the Pope. Still married to Catherine of Aragon, Henry also attempted to marry Anne Boleyn but the marriage was annulled. In 1534 the Pope ex-communicated England from the Roman Catholic Church because of Henry’s marital affairs. It was no bother to the king though, Henry set up his own church, the Church of England, and assumed himself the title of supreme ruler. In a show of allegiance to the Kings decision, and perhaps so as to not fall ill-of-favour with him, many pubs changed their names, or adopted monarchy associated titles, such as “The Kings Arms”. 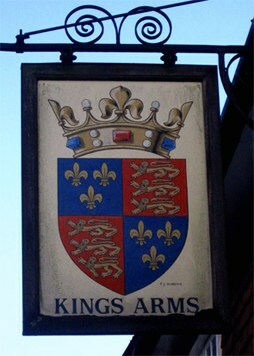 ”The Kings Arms” literally means, the King’s Coat of Arms, essentially the kings logo. Emblazoned upon his shield in the heat of battle, if you saw the king’s logo you’d instantly know whether to capture its wearer for ransom, or give your life to protect it. “The Kings Arms” continues to be a very popular British pub name, commemorating Kings of Britain since Henry VIII’s reign. No doubt when Britain receives a new king some pub landlords will continue the patriotic, royalist British custom of celebrating the monarch by reflecting it into their pub name. “The Bull and Bush” celebrating his victory at Boulonge, or “Boulogne Bouche” as it was known. Some pubs named “The Greyhound” were a reflection of Henry’s love of greyhounds, as well as keeping them for sport he had a variation of the royal coat of arms displaying a white greyhound as a charge. “The Kings Arms” is number 10 in BITEs most popular pub names (2011) with 203 pubs in our database using “The Kings Arms” in their title, another ambiguous fact is that during the writing of this blog-post without any influence by us, our most popular pub page based on views yesterday (16/08/2011) was The Kings Arms, Waterloo – BITE users are all in agreement this is “a gem of a pub”. We’ll be discussing the origins of the other 9 most popular pub names in weekly posts, so stay tuned. If you’ve got any comments feel free to leave them in our comments section below, or join in the conversation on our Facebook page. It’s predominately a right-handed world we live in, many of us ‘lefties’ have been persecuted by sinistrophobia* at some point in our lives, either by people or by design and manufacture. 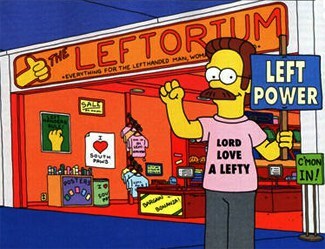 If you’re one of our many BITE readers who is naturally left-handed, this coming Saturday (13th August) is your day to hold your left-hand up high and be counted as we celebrate ‘National Left Hander’s Day 2011’. Get down the pub, demand that the barman serve you a pint in a left handed pint-glass, stand at the bar drinking from your left-hand and intrigue your friends with your knowledge of left-handedness. As a fellow left-hander, H. G. Wells wrote the first draughts of his famous books, ‘War of the Worlds’, ”The Time Machine’ and ‘The Shape of Things to Come’ using his left-hand. When current U.S. President Barrack Obama signed his name and the wrong date in the visitors book at Westminster Abbey, he made the gaffe with his left-hand, being one of eight left-handed U.S. Presidents to serve office. Master puppeteer Jim Henson was left-handed, making by proxy Kermit the Frog also left-handed. Left-handed people are three times more likely than right-handed people to become alcoholics, the right side of the brain being more susceptible to the effects of alcohol. Left-handed stroke victims have been known to recover faster than right-handed stroke victims. Left-handed people are also generally better at 3-dimensional perception. This has connections to creativity, and it’s known that left-handed people process shape using a “visual simultaneous” method in which several threads of information can be processed simultaneously into the brain. In 60s music, Jimi Hendrix played a right-handed Fender Stratocaster strung upside down to accommodate his left-handedness. Paul McCartney of The Beatles is left-handed; when he first played alongside John Lennon , he played Lennon’s right-handed guitar upside-down. Ringo Starr, also left-handed, made 50% of the Beatles members of the left-handed club. In the Middle Ages, writing with your left-hand was believed to be a sign of demonic possession and often punishable by death. Half of left-handed people use a computer mouse with their right-hand, and have a higher average of multi-tasking, in this case being able to use a pen and paper at the same time as a computer mouse. Dreams, gut-feelings and paranoia are controlled by the right side of the human brain, left-handed people can tap into these instincts with much more ease than right-handed people. Left-handed peoples eyes adjust to being underwater much quicker than right-handed people giving them faster orientation skills. If you’re left-handed or you know a left-handed fact, you can leave a comment in our comments section below, or by joining in the conversation on our Facebook page.